Today I’m talking about business forecasts – an important part of your business plan. Forecasts help you to predict your businesses income and costs. Business owners and managers often tell me that working out a business forecast can be tricky. Of course none of us has a crystal ball, but we don’t need to know exact sales figures to create a forecast. A business forecast gives us something to aim for and measure against. They help us to grow our business and ensure they’re profitable. Think about your plans for the coming year and any additional overheads. For example will you need to replace any machinery or employ more staff? By adding these up you’ll know how much each product costs to produce, or how much it costs you to deliver a service. Once you have this cost you can calculate profit margins and charges. For example a maintenance company that charges £50 per hour needs to ensure that this covers all costs and creates a profit. Direct costs might include wear and tear on the vehicle, fuel, the worker’s cost per hour, protective clothing, plus the employer’s part of National Insurance. You’ll need systems in place to ensure that your revenue is calculated accurately, and that you have good cash flow. If you’ve been trading for a number of years you can use previous trading history as a basis for your business forecasts. I always advise my clients to be conservative when forecasting their income. Don’t forecast based on your dreams or wish to purchase a new Porsche! My clients draft a number of forecasts ranging from a ‘worst case scenario’ forecast to those based on realistic growth. Base at least one forecast on your ‘current gross margin’ – that’s the difference between your direct costs and your total revenue, as a percentage of total revenue. 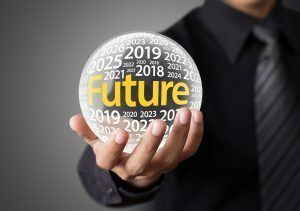 Although we don’t know for certain what the future will bring, we can do a PESTLE analysis to understand some of the threats and opportunities we can expect. This covers political, economic, social, technological, legal and environmental influences. By looking at your business in this detail you’ll be better prepared if growth comes quicker or at a much higher rate than expected. If planning for growth, ensure that you calculate the additional costs of extra staff, recruitment costs, National Insurance, pensions, training and benefits. You may need to consider bigger premises, and associated costs. Forecasting cash flow is a must for any business. Some companies revise their forecasts on a quarterly basis, bringing in the actuals for the previous months. This gives the business a rolling and more accurate management tool. My strong recommendation is to forecast as far into the future as possible, to ensure you’ll have more warning of leaner times.